Pulling into the parking lot, off Valley Parkway between Rts. 82 and 42, you’ll find plenty of parking. Walk around to the right of the Chalet and you’ll find the ticket window. Purchase your ticket, walk through the portal, grab a 40# toboggan and start climbing stairs. 124 steps wind you back and forth, up the hill, until you reach the top. At the top, climb aboard your toboggan and you’re off on your 15 seconds of windblown adventure. Dual chutes are available in case you’ve got friends who want to race you to the finish. At the end of the ride, hop off, walk back and do it again. Thankfully, the kind Metropark’s people take care of transporting all the toboggans back to the base of the hill for you. Photo opportunities abound. You can shoot from outside, braving the elements, or shoot through the big glass windows of the chalet. 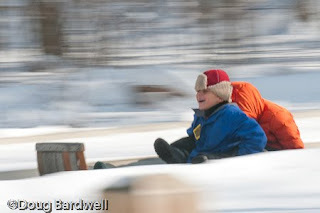 Crank up that shutter speed to 1/250th of a second or better and pan your camera as the sleds fly by. Slowing the shutter speed to 1/60th or so, and panning carefully, will render a shot with great motion blur for a background. (See the slideshow below for examples.) You can shoot at the base of the hill for that dramatic vertical drop look, or move further down the tracks to get the toboggans racing for the finish line. For 42 years, the Cleveland Metroparks have been providing excitement for winter thrill seekers. From the day after Thanksgiving, through the first weekend in March, weather permitting, the chutes are open Thursday through Sunday. You can call 440-572-9990 to make sure. According to Melissa Tirpak-Chylik, Chalet Manager, groups come from all over, including one group from Arizona, to enjoy the tobogganing. If you have a group, you can arrange for private hours and days of operation. Check the Cleveland Metroparks Web page for more information. Thursday 6:00 p.m. – 10:00 p.m.
Friday 6:00 – 10:30 p.m.
Saturday Noon – 10:30 p.m.
You must be 42” or taller to ride and being in good health is strongly advised. Back problems, scared of heights, heart trouble? All those might be good reasons you’d prefer to watch only. But there’s a place for that too. Inside the Chalet, where a big wood fire keeps things cozy, you can watch from the second floor and get great views as your friends speed by on the chutes. There’s a snack bar as well and they keep the hot chocolate flowing.